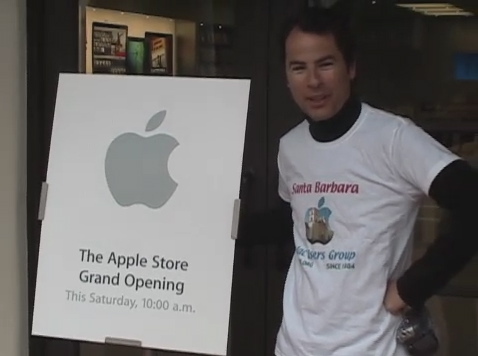 Views of the Santa Barbara Macintosh Users Group and local Macintosh retail shops. Made on a Mac by Harold Adams, November 2003. Running time: 1 minute 40 seconds. Apple opens its long-awaited State Street location. SBMUG members are on hand to welcome them to Santa Barbara as well as enjoy all the festivities and celebration. Made on a Mac by Harold Adams and Ian Lessing. Running time: approx. 8 minutes. SBMUG members visit Macworld Expo in San Francisco, January 2007. Here’s a sampling of what they saw and what the experience was like. Made on a Mac by Harold Adams and Robert Adams. Running time: 4 minutes 35 seconds.